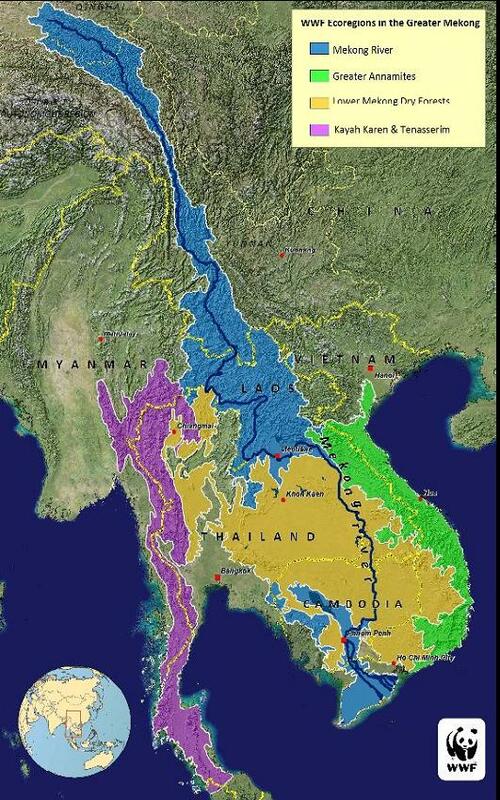 According to a recent news by the WWF, the region of the Greater Mekong (left) is a biological treasure trove, as it enabled to discover more than a thousand new species in only ten years. Nonetheless, all these species are threatened by economic growth and the lack of environmental protection in Thailand, Cambodia, Vietnam and other countries of the region. This has to change as I noted earlier, we have to protect Nature as it is protecting us. To read out more on this topic, see you after the jump ! Over a thousand new species have been discovered in the Greater Mekong Region of Southeast Asia in just the last decade, according to a new report launched by WWF. First Contact in the Greater Mekong reports that among the 1068 species newly identified by science, between 1997 and 2007, were the world’s largest huntsman spider, with a leg span of 30 centimetres, and the startlingly hot pink coloured cyanide-producing “dragon millipede”. While most species were discovered in the largely unexplored jungles and wetlands, some were first found in the most surprising places. The Laotian rock rat, for example, thought to be extinct 11 million years ago, was first encountered by scientists in a local food market, while the Siamese Peninsula pitviper was found slithering through the rafters of a restaurant in Khao Yai National Park in Thailand. “This region is like what I read about as a child in the stories of Charles Darwin,” said Dr Thomas Ziegler, Curator at the Cologne Zoo. “It is a great feeling being in an unexplored area and to document its biodiversity for the first time… both enigmatic and beautiful,” he said. The findings, highlighted in this report, include 519 plants, 279 fish, 88 frogs, 88 spiders, 46 lizards, 22 snakes, 15 mammals, 4 birds, 4 turtles, 2 salamanders and a toad. The region comprises the six countries through which the Mekong River flows including Cambodia, Lao PDR, Myanmar, Thailand, Vietnam and the southern Chinese province of Yunnan. It is estimated thousands of new invertebrate species were also discovered during this period, further highlighting the region’s immense biodiversity. The report stresses economic development and environmental protection must go hand-in-hand to provide for livelihoods and alleviate poverty, and ensure the survival of the Greater Mekong’s astonishing array of species and natural habitats. “This poorly understood biodiversity is facing unprecedented pressure… for scientists, this means that almost every field survey yields new diversity, but documenting it is a race against time,” said Raoul Bain, Biodiversity Specialist from the American Museum of Natural History. The report recommends what is urgently needed to protect the biodiversity of the region is a formal, cross-border agreement by the governments of the Greater Mekong.